On Sunday, December 5, from 2:00 to 4:30 p.m., the Old City Quartet makes their New York debut performing works by Haydn, Debussy, and Mendelssohn in Tishman Auditorium, 66 West 12th Street, as part of the Schneider Concerts series. Formed at the Curtis Institute of Music in 2008, the Old City Quartet has won praise from some of the greatest chamber musicians of our time. Members of the quartet have appeared as soloists with some of the world’s finest orchestras, including the Philadelphia Orchestra, the Tokyo Philharmonic, and the BBC Concert Orchestra. The Old City String Quartet is the 2010 Fischoff National Chamber Music Competition Gold Medalist and Grand Prize Winner. Founded in 1957, the Schneider Concerts chamber music series has been hailed in the New York Times as one of the best deals in town for lovers of classical music., It is known for presenting many of the world’s chamber music notables before their rise to fame. 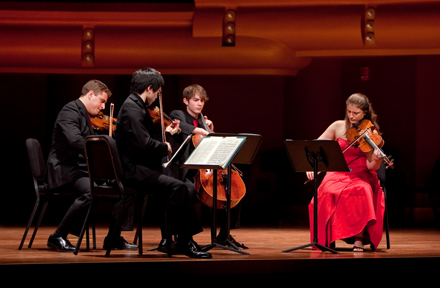 Peter Serkin, the Guarneri String Quartet, and Tashi made their New York debuts in Schneider Concerts; Yefim Bronfman, Yo-Yo Ma, and Murray Perahia also performed in the series early in their careers. Admission is $17.50 general admission, $15 seniors citizens, $5 stand-by tickets for students 30 and younger with student ID. This concert is also available as part of a Schneider Concerts seven-concert subscription ($82) or five-concerts subscription ($70). To order single tickets in advance, call 212.229.5488. For subscription information call 212.229.5873.